Nowadays, more and more people want to find a free MP4 converter becasue most portable media players (iPod, iPad, iPhone 4S, iPhone 5S, iPhone 5C, Samsung devices, Roku player, HTC, etc.) can play MP4 videos. MP4 video is now the most widely used video format. Any Video Converter Free version is an excellent choice for mp4 conversion. With powerful capability of converting both SD video formats (AVI, MPEG, WMV, DivX, MP4, MKV, RM, MOV, RMVB, and VOB) and HD video formats (AVCHD, H.264/MPEG-4 AVC, HD AVI, AVCHD, HD MPEG4, HD MOV, and HD WMV) to MPEG-4, Any Video Converter helps all PMP users to better enjoy their digital life! This free MP4 Converter includes all optimized MP4 output profiles for iPod, iPhone, iPad, Samsung, Kindle Fire, NookHD and more. It's best free MP4 converter! Any Video Converter Free is a versatile MP4 converter and can convert AVI, WMV, M2TS, FLV, MKV, MOV, MPG, 3GP, QT, RMVB and other video formats to MP4 video optimized for all kinds of portable media players. The free MP4 Converter can convert videos to MP4 videos ready for use on iPod, iPod Touch 5, iPhone, iPad, PSP, Apple TV, ZTE Grand S, ZTE Anthem 4G, Roku player, Acer Iconia Tab A700, Samsung Galaxy S10, LG Optimus G Pro, mobile phones, etc. Before converting to MP4, this free MP4 converter allows you to clip video segments, crop unwanted areas, merge multiple videos into one, add special effects, add subtitle and watermark. Also, you can use customized MP4 as output if specific device is not listed in output profiles. You can easily custom video size, bitrate, frame rate, audio bitrate, etc. to get customized MP4 designed for your MP4 players. How to convert any video to MP4 for PMPs? PMP (Portable Media Player) is the multimedia device that can play digital audio, video, images, and even games. Some PMPs also provide functions and access to Internet and WiFi. 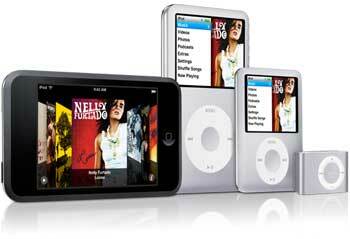 Notable PMPs include Apple’s iPod, Sony PSP, Archos and Creative Zen. MPEG-4 was defined by the Moving Picture Experts Group (MPEG). The MPEG Group also set up the standards of MPEG-1 and MPEG-2. MPEG-4 delivers high quality of audio and video streams, especially for cell phone and broadband. Besides audio and video, MPEG-4 also supports 3D objects, sprites, text and other media types. MPEG-4 is ready to stream incredible-quality audio and video today in QuickTime. With the free QuickTime Player or browser plug-in, you can play back any compliant MPEG-4 file. Upgrade to QuickTime Pro, and you can author your own MPEG-4 content. Inheriting QuickTime’s stability, extensibility and scalability, MPEG-4 can transport media at any data rate, from media suitable for delivery over dial-up modems to high-bandwidth networks. Now, more and more PMPs include high definition screens, making on-the-go movie-watching a reality. PMPs that capable of displaying high definition MP4 are as follow: Creative Zen, iRiver, Sandisk Sansa, Archos, Nintendo Wii, Gigabeat, Sony Walkman, Xbox 360, GoGear, Kinder Fire, etc. So far, Any Video Converter has covered most of the PMPs that support high definition MP4, enabling you to easily enjoy your favorite movie in HD MP4 on the go. With Any Video Converter, you can convert video to MP4 for iPhone, iPad, iPod Nano/Classic and iPod Touch with Apple product output profile. How to convert video for iPod Touch/iPhone/iPad with Any Video Converter? Please download and install Any Video Converter Free first. Click Output Profile drop down menu to select proper output profile for iPod/iPhone/iPad. Click "Output Profile>Apple iPhone/Apple iPod/Apple iPad" and choose one according to your need in the profile drop-down list. Click Convert Now button to start converting videos. Once the conversion is finished, you can click "Output Folder" button to get the output files. * Don't know how to transfer files to iPod/iPhone/iPad? We recommend you our free Syncios, which is the best alternative to iTunes to help transfer videos between iPod/iPhone/iPad and PC freely and easily. *Samsung Galaxy Note gained widely attention as soon as it hit the market for its quad-core CPU and 5.3” AMOLED display with RGBG-Matrix (Pentile) and WXGA (1280 x 800) resolution. *Samsung Galaxy Note 2 comes with a 5.5-inch HD Super AMOLED display with a resolution of 1280 x 720, and a 16:9 screen ratio to give a nice, widescreen, cinema-like viewing experience, a 2GB RAM, an 8MP autofocus, LED flash primary camera and Android 4. *Samsung Galaxy S features a 1 GHz ARM "Hummingbird" processor, 8–16 GB internal flash memory, a 4 inches (10 centimetres) 480×800 pixel Super AMOLED capacitive touchscreen display. *Samsung Galaxy S II, the successor to the Samsung Galaxy S, supports MPEG-4, H.264, H.263, DivX HD/XviD, VC-1, 3GP (MPEG-4), WMV (ASF) as well as AVI (DivX)), MKV, FLV and the Sorenson codec. For H.264 playback, the device natively supports 8-bit encodes along with up to 1080p HD video playback. The dual-core Exynos chipset meets and exceeds the benchmarks in its peer group. *Samsung Galaxy S III, which is powered by a 1.4 GHz quad-core processor with 1 GB of RAM with a screen of 1080p Full HD resolution, has now become one of the main rivals to Apple's iPhone 4S and HTC's One X. Its HD Super AMOLED display measures 4.8 inches (120 mm) on the diagonal, second to that of Samsung Galaxy Note. *Samsung Galaxy S IV, which takes almost every specs to an extreme – the screen is larger (5 inches), the resolution is greater (1080p), the battery capacity higher (2600mAh), the processor faster (1.9GHz quad-core or 1.6GHz octa-core) and the rear-facing camera stuffed with more megapixels (13, to be exact). Now, Any Video Converter includes well-set output profile for Samsung Galaxy Note, Samsung Galaxy S II and Samsung Galaxy S III, helping you convert video to samsung galaxy and enjoy the most advanced samsung galaxy mp4 video technology at no time. * Don't know how to transfer files to Samsung Galaxy phones? We recommend you our free SyncDroid, which can transfer files and backup Android phones amazingly. How to download YouTube video as MP4? YouTube videos are available in a range of quality levels. The former names of standard quality (SQ), high quality (HQ) and high definition (HD) have been replaced by numerical values representing the vertical resolution of the video. The default video stream is encoded in H.264/MPEG-4 AVC format, with stereo AAC audio. As leading video solution provider, Any Video Converter keeps pace with YouTube upgrading and added YouTube MP4 downloading funtion as well. Users can not only download YouTube FLV video and 3gp mobile phones video but can also download YouTube MP4 video for any PMPs without converting. With Any Video Converter, you can simply click "Download +" Button and paste YouTube URL to the pop-out box. Then click Download Button, choose video download format and start downloading. Converting DVD to MP4 is no longer mission impossible for Any Video Converter now. Any Video Converter has a most advanced version Any Video Convert Ultimate which is released as an individual program that includes all featues of Any Video Converter but also could be a DVD to MP4 converter. It comes pack with output profile for converting DVD into MP4 videos that supported by Apple product, Sony product, Microsoft product, Android product and more... Users are free to convert DVD to MP4 for any protable device as they want. Any Video Converter Ultimate is not only a video and DVD converting tool, but also a powerful yet simple screen recorder program. It performs perfectly in recording any local and online videos (such as Nico, Yahoo, iTunes, Google, Metacafe...) with high output audio and video quality. What's more, all the recorded videos are in MP4, which makes it easier for you to enjoy the videos on your portable devices. MP4 is a shortened name for MPEG-4 Part 14. Sometimes otherwise known as MPEG -4 AVC, the AVC standing for Advanced Video Coding. As this name suggests, it is a format used for encoding digital video files. It was created in 1998 and is now gaining ever more popularity in the mainstream market. The 'MPEG' part of the name is an abbreviation of Motion Pictures Expert Group, who are the body involved in setting industry standards for digital video and audio. Read More: How to Convert iTunes M4V to MP4? Unlike other downloaded video files, Apple puts the DRM protected M4V on its iTunes to encode movies, TV episodes, music videos, etc which means a M4V movie purchased or rented from iTunes Store is only allowed to be played on Apple devices because of DRM. You cannot directly convert the iTunes M4V to MP4 with common video converters. You should first remove the DRM protection thus to convert the M4V video to MP4. NoteBurner M4V to MP4 Converter (For Mac & For Windows) , a professional iTunes M4V to MP4 video converter which can help you remove DRM protection and convert iTunes movies and TV shows losslessly to various video formats with 20X faster speed.